The secret behind the mysterious Spore WTF website is revealed, as Maxis announces day one downloadable content for the Spore Galactic Adventures expansion from the deranged minds behind Robot Chicken. 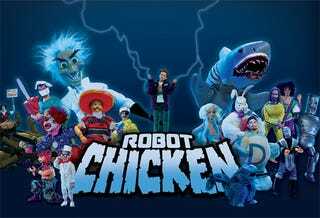 Robot Chicken co-creators Seth Green and Matt Senreich conceptualized a special campaign for Spore Galactic Adventures, which was then handed off to their writing team to add in what in the television business is commonly referred to as "the funny". The special campaign will be available for free on June 23rd when the expansion launches. "We're big fans of Spore, so teaming up on Spore Galactic Adventures was a natural fit and so much fun for all the guys at Robot Chicken," said Seth Green, co-creator of Robot Chicken. Co-creator Matt Senreich continued: "We're all gaming geeks, so when the Spore guys said they had an alluring proposition for us, how could we say no? Instead of creating absurd worlds with toys, this gave us the opportunity to create literally anything we wanted as gamers. Geek moment. We think that RC fans will love the pretty random and absurd adventures we created and we can't wait to goof around with the ones the fans create." While the official announcement is a bit vague on what to expect from the new adventures, they do mention planetary rest stops, man cannons, and banana monkey wars, which are of course the three core elements of any successful science fiction project. More information should be available soon at http://www.spore.com/wtf.